It's the month of love and two of the main beauty boxes have gone all out pink on us! As I was pleased with the contents of both of the above boxes I thought I'd share them with you. 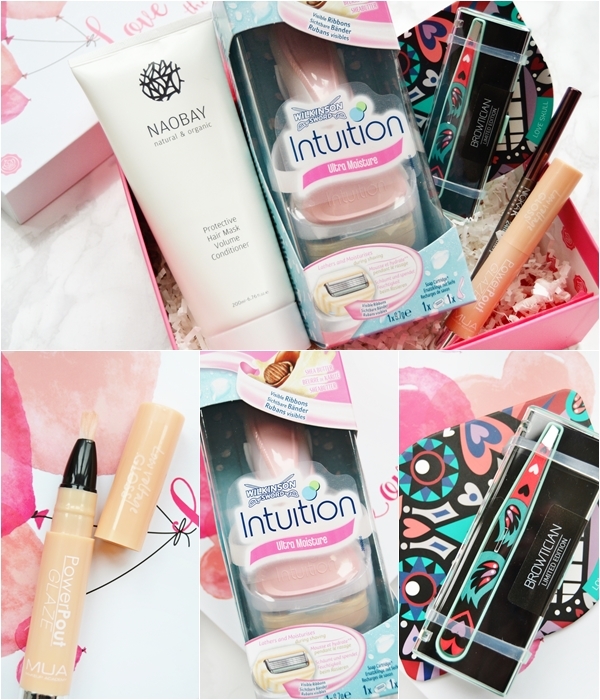 Over the past few years I have been on the fence about beauty boxes as they can swing from amazing one month to boring and lack luster the next. However if you like the concept of trying new products each month then my advise would be to start off on a box that you love (i.e one of these!) and then cancel if you aren't happy with your next box. This month's Glossybox is all about finding your beauty soulmates and being paired with the products that are basically 'the one'. From haircare to makeup and a few products in between this Glossybox has got us covered with a good mix of full size products and a super cute box to re-use. You can subscribe for a 3-month plan for £12.75 a box here. What's included - Nicka K New York 24H Waterproof Eyeliner (worth £3.99), MUA Power Pout Glaze (worth £3.50), Browtician Limited Edition Tweezers (worth £7.99), Naobay Protective Hair Mask Conditioner (worth £10.64), Wilkinson Sword Intuition Razor (worth £6.99). Where to start with this box! I literally love everything in it! This reminds me of how good beauty boxes can be - a good mix of products, all full size, a mix of price points and no obscure brands you've never heard of. My favourite product from the box would be the Browtician Tweezers as I love the design and after trying them found them to be super sharp and precise. I also love the eyeliner for the packaging/shade, the conditioner as I was after a new one to try and the size of it is huge and the MUA Power Pout Glaze is a totally new product to me and now one I will be buying more of as I love it so much. Also the Wilkinson Razor is going straight into my shower as I love moisturising razors like this but never treat myself to them. Overall - A total winner of a box! Simply nothing to fault and all the products will get used and enjoyed. I really hope Glossybox keep this standard up! 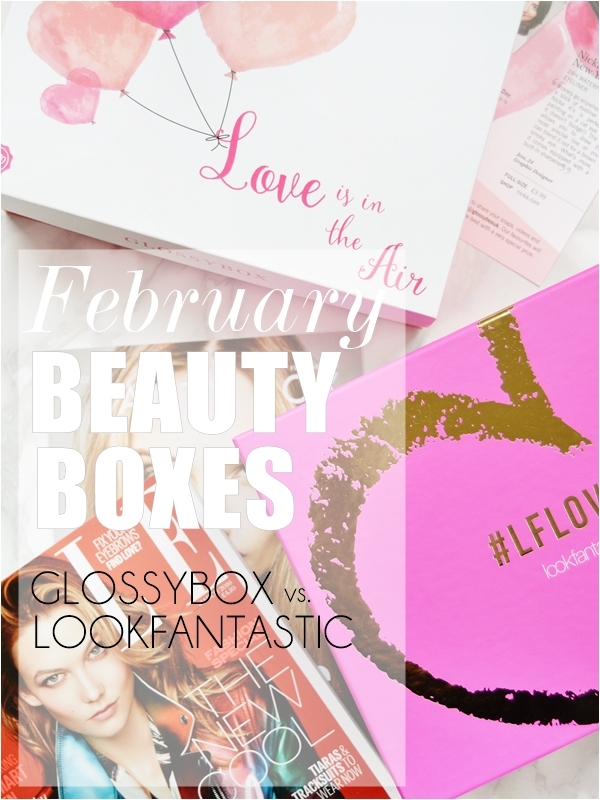 On to the beautifully boxed Look Fantastic box that is named #LFLOVES this month. This contains a good mix of deluxe samples and one full size product worth £18.99. Also the Look Fantastic box has the benefit of not having a subscription so if you like the look of it or future boxes from reviews online you can buy it within the month for a one off price of £15.00 here. On opening this box I was a little unsure of the contents as it's mainly deluxe samples however the full size brow palette is a bit of a gem as it can be used to fill in the brows and as an eyeshadow palette as well - I'm actually already using this and loving it! I was also pleased to see a Lord & Berry lip crayon sample in the box, though I love the shade I'm a bit confused as to why it's a hard pencil and not a soft creamy one as the full sized lip crayons are. I will also enjoy using the Bliss Body Butter but due to the fresh scent (which I love) I will be saving it to use in spring/summer. The KMS Conditioner is also a nice sample as it has a lovely scent and a slightly purple tint to brightened coloured hair... perfect for my dulling ombre ends. The only sample I'm not that keen on and will pass to someone that will use it, is the Monu Bali Body Oil as it has a strong lemongrass scent which just doesn't seem suited to a relaxing body oil for me. Overall - As Look Fantastic boxes go this isn't one of their best as in total the box is worth £40 however I personally still like it. I would have liked to have seen more than one full sized product in the box but overall I will use pretty much everything and the addition of the mini hairbrush and Elle magazine are nice extras for the £15 price tag. 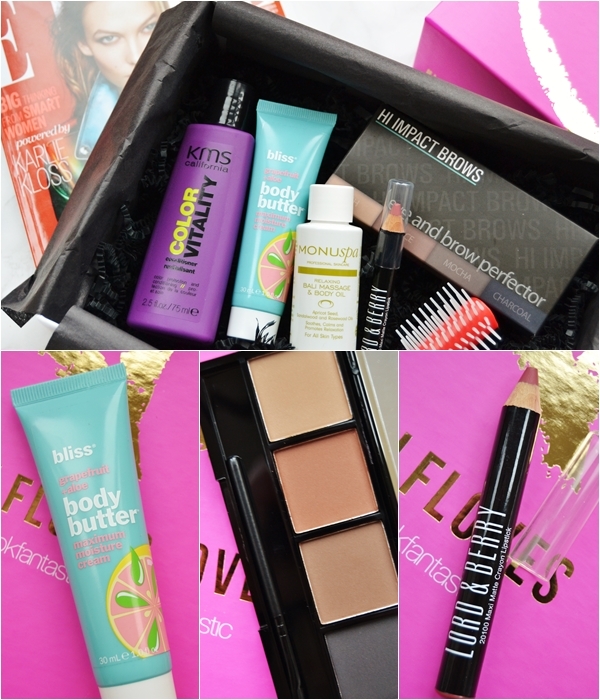 As you may have guessed my favourite beauty box this month is Glossybox! A true gem with so many products I'm eager to use.